Microsoft Research launches AutoCollage 2008 today, a desktop app which, it says, allows users to compile sets of photos into, surprisingly, collages. 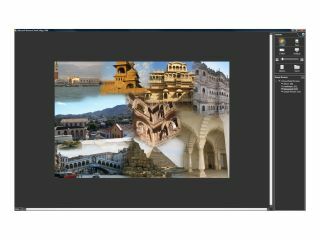 In just a few clicks, says Microsoft, users can "transform an unwieldy group of photos, for example, of an event like a wedding or holiday, into a single collage image". The program can then print the image, email it, make it into an e-postcard, a web page or a desktop background. The program works by considering various criteria in its image creation, says Microsoft. For a start, it's apparently capable of deciding which images to include in a collage to represent the general theme of the piece – so should avoid duplications and focus on people or groups of people. Microsoft also claim the product is capable of "laying out the images in an interesting way", and also blending them together for invisible joins. "We've tested tens of thousands of different collages in the course of our research," said Carsten Rother, of Microsoft Research Cambridge's Computer Vision Group, "And it's really exciting that the positive feedback we've received from our user studies shows we're answered these challenges successfully." You can see if you agree with Carsten by grabbing a 30-day free trial from Microsoft, with the option to upgrade to the full version for £20.